Q-Connect Jewel Coloured Frosted polypropylene ring binder. 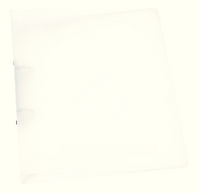 hard wearing, lightweight, wipe clean ring binders with an opaque frosted finish. Features include a 25mm 2-ring mechanism that open and closes easily and a spine label. Colour - Frosted Clear. Approx Dimensions (CM): D31 W26 H3.4. Approx Weight (KG):0.1181.